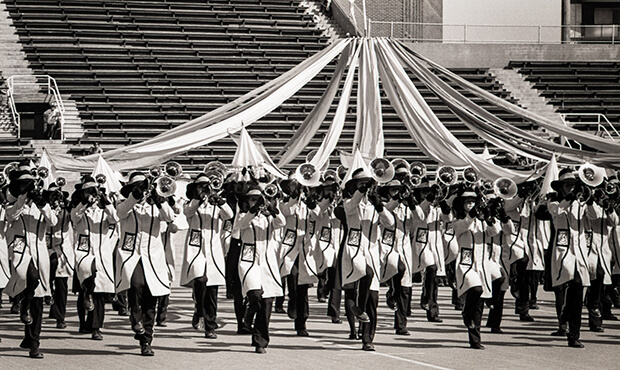 Drum Corps International celebrated its 10th and 11th World Championships by going international, heading up to Montreal for both the 1981 and 1982 events. 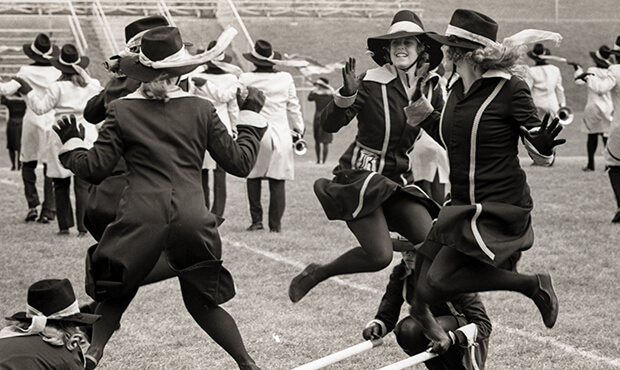 As PBS had difficulty securing permission to film and broadcast outside the country that first year, DCI videos from 1981 feature performances from the DCI Midwest Championship in Whitewater, Wisconsin. In 1981, Santa Clara Vanguard became the only corps to win a DCI World Championship after not being among the top-six corps the year before. The California corps stopped its rival Blue Devils from earning the first three-peat in DCI history by just three tenths of a point. For the first time in DCI's 10 years, half the corps broke the 90-point mark in the Finals competition. Although grounded front ensemble (pit) percussion instruments were now allowed, many corps grounded only their timpani and still marched and carried their mallet keyboards around the field. The Bridgemen's seventh-place production commenced with Julius Fucik's "Thunder and Blazes," written in 1897 and perhaps the most popular circus march ever. Originally titled "Grande Marche Chromatique" and often referred to as "Entry of the Gladiators," the title "Thunder and Blazes" was given to the piece by Canadian composer Louis-Philippe Laurendeau in 1910 when he arranged it for wind band. Many of the brass players started the show under a "circus tent," created by long banners that were affixed to a tall pole at the center of the tent, not unlike how a maypole is created. Members of the front ensemble percussion section juggled balls and a bevy of clowns and dancing animals added to the festivity of the on-field circus. The next piece, "In the Stone," was brought back from the corps' 1980 show by popular demand. Alta Sherral Willis and David Foster co-wrote the song with Maurice White, who founded the funk-rock band Earth, Wind & Fire in 1971. Willis might be better known as the composer of the television theme song for "Friends" and for penning the soundtrack to "Beverly Hills Cop." The piece appeared on the Earth, Wind & Fire's ninth album, "I Am," released in 1979. The laid-back nature of "In the Stone" really hit a nerve with drum corps fans. It was said by many that it might have been the most Bridgemen of all Bridgemen tunes, exploiting the fact that Earth, Wind & Fire's horn section might as well have been created with the drum corps in mind. For many, the piece seemed to encapsulate the hip Bridgemen attitude and cool mystique better than any other piece ever presented by the corps. Future DCI Hall of Famer Dennis DeLucia's percussion feature was based on "The Pursuit of the Lady in the Feathered Hat," written by jazz keyboardist Joe Zawinul for "Mr. Gone," the 1978 album of the jazz-fusion band, Weather Report. Zawinul is credited as one of the creators of jazz-fusion (combining jazz, rock and world music) and earlier played with saxophonist Cannonball Adderly and trumpeter Miles Davis before co-founding Weather Report. He is renown for being a pioneer of electronic keyboards. The piece featured members of the color guard dancing between two sets of perpendicular sticks on the ground that were being maneuvered next to and apart from one another and horn players doing quirky motions with their arms and hands. It was just a Bridgemen thing to do. The horns and guard then performed "The Bridgemen Shuffle," a sort of a quasi-funk/jazz stepping/mini-seizure-induced/rollicking/jumping/bouncing sort of movement. The entire second half of the show was dedicated to music from "West Side Story," extracted from the famed 1957 musical by Leonard Bernstein and Stephen Sondheim that changed the face and sound of American musical theater. 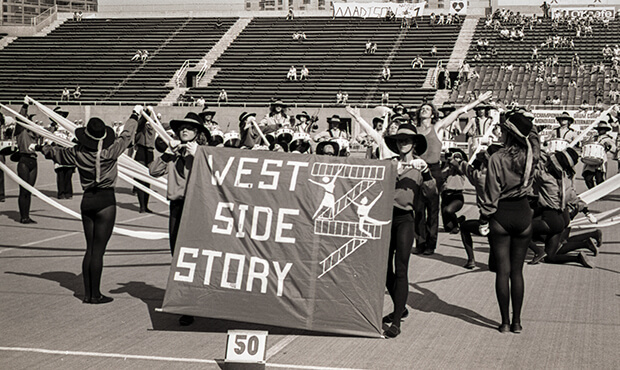 "West Side Story" was a natural for the corps since the Bridgemen were located across the Hudson River from New York City. The production started with a brash rendition of "Something's Coming," followed by the rousing "America." The latter piece is when the characters of Tony and Maria were introduced, accompanied by seven color guard members dressed in red representing the Jets gang. Seven others dressed in blue represented the Sharks gang. After a stop, the production resumed with a tender and very brief rendition of "Tonight," with Tony and Maria's embrace terminated by a member of the Jets. The entire color guard was now dressed as Jets or Sharks. The vivacious "Mambo" followed, with each side of the two opposing gangs intimidating the other via threatening arm and leg movements. Tony and Maria were kept apart until the end of "Mambo," when a gunshot "killed" him as the two gangs fought each other hand-to-hand. As Maria tenderly took care of him, the corps followed up the shooting with "Somewhere." Both Jets and Sharks circled the two doomed lovers, and magically, Tony and Maria both rose up at the end, putting their arms around their waists as the corps played the final chords of the show. At a number of shows that summer, the penalty judge's starting pistol (which served to mark the end of judging except for General Effect) was fired at almost the exact time of the gun that "shot" Tony on the field, providing for a strange and somewhat awkwardly amused audience reaction. For this week only, you can save on the Legacy Collection DVD that contains this complete Bridgemen performance. Buy the 1981 Legacy Collection DVD. Discount DVD offer ends Monday, April 6, 2015.